As human beings, our very existence is proof of the survival skills, faith, or just plain luck our ancestors possessed in order to persevere through millennia of disasters: epidemics, wars, pestilences, famines, accidents, and acts of nature. Tell about a disaster that one or more of your ancestors lived through. Did they survive a hurricane, flood, tornado, train wreck, sinking ship, plague, genocide, explosion, mine collapse, or some other terrible event? How did they survive? Research the details of the disaster and explain how it affected your ancestor (guilt, fear, faith, gratitude, etc. ), your family's history, and even yourself! 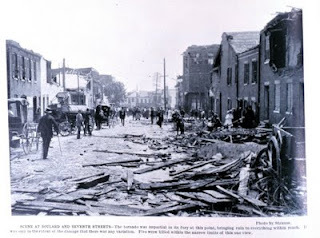 However, there were two great cyclones/tornadoes in the St. Louis area which have been written up as noteworthy disasters, and I had ancestors living in the St. Louis area at the time. The question is how much they were impacted. 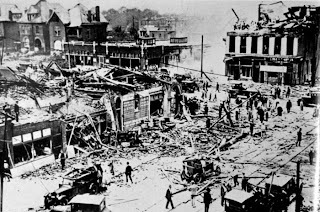 "The 'Cyclone of 1896' has been described as the single most deadly event that hit the St. Louis area in recorded history." Over 250 dead, over 150 missing, over 1000 injured. Leaving sorrow and destruction there that night. As it travels on its way from door to door. My paternal Cruvant, Feinstein and Blatt ancestors were all in St. Louis in 1896. However, the path of the cyclone is described as hitting the Southwest portion of the city, and my ancestors were in the central corridor at the time. Between 72-79 killed, over 550 injured. This tornado struck the central parts of St. Louis City. However, I think my ancestors had moved west of the city by then. In addition to all four branches of my paternal ancestry, my maternal grandmother, Myrtle Van Every, was in town. The divorce proceedings from her brief marriage in California to Dale Ridgely had been filed a month earlier, and according to her employment records from the US Post Office, she had resumed her job on Sept 26th. The cyclone hit on Sept 29th. While I'm not certain what impact these natural disasters had on my ancestors, I also have an inverse situation. There may have been a disaster that killed three of my ancestors, but I am unable to identify it. My fifth great grandfather, Mark Fretz, lived from December 1750 to Feb 24, 1840. His daughter, my fourth great grandmother, Barbara Fretz Sliver, lived from April 21, 1775 to June 10, 1840. Her daughter, my third great grandmother, Elizabeth Sliver Denyer, lived from Feb 20, 1798 to Aug 10, 1840. The latter two are recorded in family histories as having died in Texas, while their father/grandfather is likewise recorded as having died in Pennsylvania. It could easily be happenstance, but three generations dying in the same year seems suspicious to me. In this week's installment of my Friday Poetry series I go back over 2000 years to the Roman poet Catullus. I provide the original and a translation. Hath taken thee, hapless brother, from mine eyes. And, brother, for all time, hail and farewell! Neil Armstrong lives nearby Neil Armstrong, but isn't Neil Armstrong, or at least, isn't that Neil Armstrong. Apparently some people confuse a 38 year old Financial Services Professional named Neil Armstrong with the 79 year old astronaut. Though the news story doesn't say whether the astronaut ever gets asked to provide financial services. No one has ever confused me with the famous Pianist. Of course, I have never lived in Canada. And since he passed away 8 years ago, the likelihood of confusion has diminished. As far as I am aware, there is no relationship. I continue transcribing the tape my grandfather, Martin Deutsch, and his brother, Ted Deutsch, recorded in 1977. The Deutsch family immigrated to America in 1913, and the brothers are recalling their youth in the Transylvanian town of Almasu or Varalmas - depending upon whether you chose the Hungarian or Romanian language. Martin: He couldn’t explain it, I’m satisfied. Now, we do know there were ancestors, however, grandfathers and great grandfathers still in that country. Ted: Now I remember his father, he used to come and visit us. he lived in a town called Torda TORDA. Torda. In the vicinity around there. It was past Bucium. Martin: Now, we talked about Cluj and Kolishvar, but we didn’t live in Kolishvar, did we? Ted: There was a town. If you crossed over the mountains that had a railroad, it was called Hunyad, HUYAD, or something like that. Martin: That means Great-something. HUN. You know…you’ve read about the huns in the dark ages who overran a lot of Europe and actually gave their name to the word Hungary, Hungarian. This word Hunyad sounds like a Great Hun. Ted: It was bigger than our town, and it had a railroad stop, and if you wanted to go anywhere you had to drive your horse and wagon to Hunyad, where there was a station. And you could take the train to go somewhere. Ted: I wouldn’t know. First you had to go way up, then you had to go way down. Martin: It depends upon how many valleys you had to cross over the mountains. Ted: We made many trips. We made trips to a place called Margitta, where mother’s parents lived. Ted: Something like that. Margitta. That would take 2 days or three days, it was so far away. Martin: Maybe 50 60 miles away. Ted: And we would have to camp on the road outside on the street overnight. Ted: On the wagon or on the side of the road. All the sides of the road had apples, we had plenty of apples to eat on the way. Martin: There were a lot of orchards. Ted: They weren’t orchards. They actually had apples growing along the road. Martin: They didn’t have a Johnny Appleseed. Though Johnny Appleseed for some reason in my mind makes me think of somebody who’s a Romanian. But I don’t know where I got that idea. Martin: Johnny Appleseed you know was famous in this country, I think he was from the state of Iowa. He roamed the state and planted apple seeds. I don’t know what his purpose was, he thought he was doing good for the countryside for the natives to pick apples. Ted: Maybe he --- somebody was over in Hungary too, because every road I remember they had these white little kilometer signs, so many kilometers to Margitta, and I remember the roads of apple trees along the road. Martin: Of course some of them were cultivated orchards. Apples. I wonder how they marketed them. Of course, you say there was a railroad. Ted: In those days of course those apples were – we had a market in our village, they’d bring their stuff to the village and sell it. Martin: I imagine that was it, there was a public market. Ted: In German. The financiers were not financiers, they were the police. Police department. Finances they would call them. Just like the French word for their police department. Martin: I’m trying to think of the French word. I know it but I can’t think of it. Ted: We would call them…they were the guys that collected the revenue, and they would call them finances. Ted: They represented not the village but the country…state of Hungary. Ted: The administration buildings for the village. Martin: Probably they did have a county seat town which was Kolishvar. They didn’t call it a county, Would you have a word for it. Martin: But the word for the organization – I guess it’s similar to a county. Martin: They apparently kept records of births and marriages. And they probably had records of real estate, I’m satisfied of that. They must have had some word. The language lesson is frustrating. The Hungarian word 'megye' means county, so Ted was able to answer my grandfather's question, even though neither may have realized it. I couldn't believe my grandfather interrupted his brother with the French word, Gendarmes, just as Ted was about to speak again about their father's plum whiskey (slivowitz). I did find it interesting that Ted associated tax collecting with the police. Naturally, I found the discussion of nearby towns more interesting. Huedin is about 7 miles from Varalmas, and is today the nearest train station. My parents visited it on their trip in 2000. It is most likely the train station from which the Deutsch family left in 1912 and 1913. Turda is about 40 miles from Varalmas, Bucium is about 46 miles away, and Margitta is 47 miles. I know Margitta is the correct town, as we have letters sent from there to my great grandparents after their arrival in America, and it is further confirmed by cousins. I am only guessing at Bucium and Turda, though they are nearby, and fit the pronunciation on the tapes. It's not clear from the tape whether Ted thought my great grandfather was born in Turda or Bucium. Johnny Appleseed is associated with Ohio, Indiana, and Illinois. While there is no Romanian connection I can find, the discussion may illustrate the different ages of my grandfather and his brother when they arrived in America. My grandfather was 6 when they immigrated, and perhaps would have been more 'indoctrinated' with the American mythology they taught in the Chicago primary schools than his brother, who was 11. Of course, my assumption he learned about Appleseed in his youth may be wrong. There was a series of postage stamps released in 1966, two years prior to my grandfather retiring from the postal service. Blaine Bettinger, The Genetic Genealogist has an interesting entry. He addresses an article in the Evansville Courier Press which has a photograph showing six generations of a family gathered together. Like Blaine, I never met my mother's, mother's, mother's, father's mother - the relationship illustrated in the photograph from youngest to oldest. However, it would have been even more unlikely for me. Her name was Elizabeth Sliver Denyer, and she lived from 1798 to 1840. She'd have been 171 when I was born. Who is the oldest relative I recall? There are actually two questions there - eldest by age, and eldest by generation. Israel David Newmark (April 1903 - October 2004). Born in London, England, he was my great grandfather Barney Newmark's youngest brother. However, Israel was born two years prior to his first nephew. Since he was basically the same age, he became known to his nephews and nieces as Uncle Buddy. Bertha (Cruvant) Newmark (Sept 1886 - June 1978). My great grandmother. I was only 9 years old when she died, but I remember her well. She was truly of that generation. It is believed she was born in St. Louis, Missouri, though she doesn't appear in the city birth registers, and her father doesn't appear in the city directories until 1890. Family immigration may have occurred anywhere between 1876 and 1885 according to census figures. So exactly where the family was before 1890 isn't certain - we suspect they were in St. Louis, or nearby. I noted that a quick random survey of surnames available on Amazon indicated that there was some variance in page length (as much as ten pages), likely due to how much data was found for particular surnames in the databases that Ancestry used for the books. I had purchased The Newmark Name in History, and said I wasn't interested in most of my other surnames, since I knew they would be very similar books. However, I was slightly curious about the Vanevery surname, since I knew the family had a different migration history which could yield different stock history pages. The Van Every surname is also one of my few surnames where I am pretty certain everyone with the surname is related to me. It is believed all Van Everys are descended from two brothers Myndert and Carsten Frederickse (sons of Frederick Van Iveren). Therefore, I knew that the charts and graphs on name and occupation distribution would have a little more meaning for me. Still, it was almost two years before I bought it. I'm not going to repeat what I said in my first review. I will focus on the differences, as I find the differences are important to note for anyone considering purchase today. There are only two pages in the Van Every book that weren't in the Newmark book, and that's because five Van Everys purchased some federal land between 1830 and 1888. None of these were my direct ancestors. However, there is a nice stock entry on the Homestead Act, Manifest Destiny, and Daniel Boone. There at 10 pages in the Newmark book on the surname's history in England from 1851-1901, and only 2 in the Van Every book. For the obvious reason, there were no Van Everys in England. They did throw in 2 stock pages on the working conditions in England in 1881, even though they had no family statistics to attach that to. I'm not sure why they did this, except perhaps for padding. Some of my disappointment I should have seen coming, as I could tell from the Amazon descriptions that the Van Every book was 6 pages shorter. With some thought, I should have figured out why. My Van Every ancestors immigrated to America in the 17th century, but a large number of their descendants left America after the Revolutionary War. Even with just two surname books, I think I can say with relative certainty that all the books start with 1840, and the focus is on America, though they do have a sizable section on England, if applicable. Ancestry's Canadian resources have grown in the past two years, but all they had in 2007 may have been the 1911 census. So I did get a chart showing the 1911 name distribution - There were 98 families in Ontario, and 1-15 families in BC, Alberta, Saskatchewan, Manitoba, and Quebec. In comparison, there were only 3 Newmark families each in Quebec and Saskatchewan. I'm not sure what the 19th century immigration data for the Van Every surname reflects. It could be families who were traveling instead of immigrating. Or perhaps some families returned to Europe for a couple generations instead of Canada. Or there is a third possibility that there are some Van Everys in America who aren't descended from the two brothers...perhaps related more distantly. In summary, if one is evaluating which surnames to purchase a Name in History volume for, the paucity of information from Canada might play a role for some surnames. (*)I know that the Amazon pages for the books say they were published in June/July of 2007. I also know the Amazon Press Release announcing them was on November 5th. nothing halfway about our relationships. 1 Out of many one; Co-born, therefore I am. A colleague was searching for a one-word synonym of 'blood-relative'. An internet search suggested 'cognate'. I was only familiar with the linguistic definition: words with a common etymology. Ironically, I was fascinated to realize cognate's own etymology. I say 'realize' instead of 'learn' since I took high school Latin, and should have seen the roots. The metaphorical etymology of the linguistic term inspired me to reverse the metaphor with 'false cognates.' False cognates are two words similar enough in look and meaning people might assume they have the same roots, but they don't. (e.g. English boy and Japanese bōya.) A genealogical definition follows easily. And the poem was born. I wrote the poem to work on both the personal family level, as well as a national level. OK. Despite my statements of a week ago, I haven't managed to completely avoid the new Genealogy social network, and I have enjoyed participating in several group and forum discussions. As of this morning, here are the twenty "most active" groups on Genealogy Wise. I'm not sure how the term "Most Active" is measured. And as of the moment, here are the 20 "most popular" groups (measured by number of members). Genealogy Wise shows a lot of promise. The administrators of the site have made several mistakes, which may have irrevocably repelled some potential members, in their opening week. Most of it I would ascribe to lack of preparedness. Tamura Jones points out that they announced on July 7th they were hiring 15 people to help launch the site. And for all intents and purposes it was launched later that day through it being blogged about on several Geneablogger websites. So they weren't fully staffed when the initial wave of genealogists joined up. However, they have responded well, I think, by listening to the complaints, and seeking input from the community. Any social network is a product of its members, and there are a lot of experienced genealogists participating on the website, so it could be a valuable resource to expand one's genealogical knowledge, as well as a potential place to discover kin. I don't know of any kin who lived in Greene County, Missouri (Springfield area). However, I wish I did. 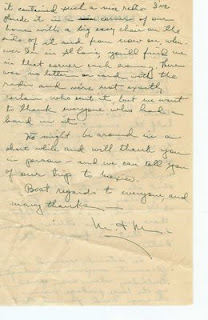 The Springfield Library has a great collection of digitized documents. And the Turnbo Manuscripts by Silas Claiborne Turnbo 1844-1925. "a collection of approximately eight hundred short tales, stories and vignettes that reflect life along the White River Valley in northwest Arkansas and southwest Missouri during the latter half of the 19th century." There's more too. Collections of photographs, postcards, maps, and local histories. An indication that there are some people in Provo, UT right now scrambling to figure out what happened. I suspect it will be fixed soon. And then everyone who has become addicted to this new social network can return from whatever productive activity they were replacing it with. Before they left, a party was thrown for her by her cousin. A write-up appeared in three newspapers. Unfortunately, while she saved the newspaper clippings, my grandmother neglected to note which newspapers, or the date. A ‘gay nineties’ party with the hustle and bustle and leg of mutton, brown derbies, high-water pants, misplaced eyebrows and swallow tail coats reminiscent of what the well-dressed males and females wore back in the good old days, was given last Saturday night by Miss Belle Wyman, daughter of Mr. and Mrs. Jacob Wyman, 5467 Delmar boulevard, in the form of a farewell party for her cousin, Miss Belle Feinstein, daughter of Mr. and Mrs. H.M. Feinstein, 6422 San Bonita avenue. The guest of honor wore a gown belonging to her great aunt. Miss Feinstein will leave for the west coast early in January and will visit several months with relatives and friends. Present at the party were: Misses Belle Feinstein, Belle Wyman, Bonnie Schwartzman, Belle Hoffman, Stella Samuels, Florence Greenberg and their escorts, Morris Pearlmutter, Bennie Feinstein, Harold Newmark, Melvin Newmark, Sandy Adler, Bob Kalm, Barney Cruvant, Harry Klein, and Meyer Brownstein. 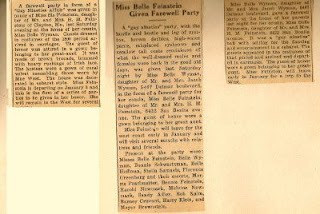 A farewell party in form of a “Gay Nineties Affair” was given in honor of Miss Sis Feinstein, daughter of Mr. and Mrs. H.M. Feinstein of Clayton, Mo., last Saturday evening at the home of her cousin, Miss Belle Wyman. Guests dressed in costumes of the 1890 period arrived in carriages. The guest of honor was attired in a gown belonging to her great-aunt. It was made of brown brocade, trimmed with heavy ruchings of Irish lace. The hostess wore a gown of coral velvet resembling those worn by Mae West. The house was decorated in cabaret style. Miss Feinstein is departing on January 3 and this is the first of a series of parties to be given in her honor. She will remain in the West for several months. Miss Belle Wyman, daughter of Mr. and Mrs. Jacob Wyman, 5467 Delmar boulevard, gave a farewell party at the home of her parents last night for her cousin, Miss Belle Feinstein, daughter of Mr. and Mrs. H. M. Feinstein, 6422 San Bonita avenue. It was a “gay nineties” ball with setting for the dancing and entertainment in a cabaret. The guests appeared in the costumes of that period and arrived and departed in carriages. The guest of honor wore a gown belonging to her great aunt. Miss Feinstein will leave early in January for a trip to the west. Belle Feinstein and Belle Wyman were both named after their grandmother, Belle Wyman Blatt, who I mentioned on Saturday. My grandmother's brother nicknamed her 'Sissie', and the nickname stuck with her her entire life, often shortened to 'Sis'. However, I am a little surprised that one of the three newspapers used the nickname. I'd love to know for certain which great-aunt's dress she wore. My suspicion is that it belonged to Tillie Oberman, the sister of her grandfather, Selig Feinstein. Tillie lived in St. Louis, so would have been around to loan my grandmother her dress. 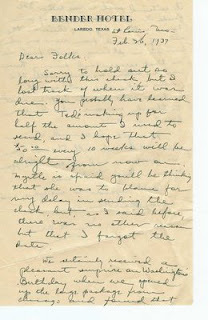 Randy at Genea-Musings for his weekly Saturday Night Genealogy Fun asks us to travel in time. 1) Let's go time traveling: Decide what year and what place you would love to visit as a time traveler. Who would you like to see in their environment? If you could ask them one question, what would it be? Travel back in time to 1850. My great-great grandmother Sarah Ann Hartley was about 16 years old, and according to the census, I believe she is a helping hand for Sarah and Hardy Ware in Houston County, Texas. Her mother, Eliza, and brothers William and Samuel are in a different Houston household, along with a Wheeler family. I'd like to interview Eliza: "Tell me everything you know about your parents, and your late husband George's parents." Maybe Eliza can help me get the facts of our Native American ancestry straight. By 1900 when they were standing in front of the Dawes commission, Eliza's son Samuel, and several grandchildren, were mightily confused. Sarah passed away in 1898. Travel back in time to 1890 Losice, Poland. Great great grandparents Morris and Belle Blatt should still be married with two infants: Blanche and Anna. [I'll need an interpreter who understands both Yiddish and English for this trip.] Since I can only ask one of them the question, I'll ask Belle to tell me everything she knows about her parents and Morris's parents. Family lore, directly from her daughters, says Belle's maiden name was Wyman. Her daughter Blanche also married a Wyman. Research has found *a* Morris Blatt in Losice who married a Chaia Beila Boksern. The middle name is close enough to Belle, but it is doubtful her daughters would have confused the surname, especially since one of them married a Wyman, resulting in the obvious family jokes. However, one of Belle's granddaughters thinks Morris was Belle's second husband, making it possible Boksern was her first married name. Hopefully Belle/Beila can straighten this out. If the research found the correct Morris Blatt, it tracks the Blatt line back several more generations. There are more people I'd interview, but choosing one from my maternal and one from my paternal lineage seems like a fair place to stop. In Oxford, Alabama a 1500 year old Indian mound (likely a burial mound) is being destroyed and replaced by a Sam's Club. Four employees at a cemetery outside Chicago are accused of digging up bodies and reselling plots at a historic black cemetery. Oliver Wendell Holmes is a distant cousin of mine through shared Stoughton ancestry, however, the below poem is about his mother's mother's mother - Dorothy Quincy. So they painted the little maid. Sits unmoving and broods serene. That was a Red-Coat’s rapier-thrust! Hint and promise of stately mien. 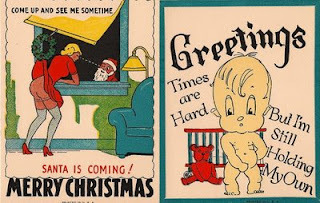 Disclaimer-wise: As an aficionado of the English Language, I am predisposed against the new social network website –GenealogyWise – due to their appropriation of the painful-to-the eyes ‘wise’ construction. If there was a way to kill usage of ‘wise’ as a suffix, I would do so. Yes, I am aware there is also a pun on ‘wisdom’ in this case, but this isn’t sufficient to get me to support the corruption of the English language. The new website was announced on Wednesday, and there was a heavy stampede from geneabloggers – many who had been utilizing Facebook. Several individuals were heard saying that they planned to leave Facebook entirely. I, for one, am not leaving Facebook. Of course, I was a member of Facebook before the geneablogger stampede towards it, and have many non-genealogist friends with whom I keep in touch using it. My non-genealogist friends won’t be switching to GenealogyWise so there’s no reason for me to leave. If I only networked with other genealogists on Facebook, I could see the temptation to delete my account. But that doesn’t define me. Those genealogists who do leave Facebook are going to lose a few advantages to my mind. 1) Facebook is a great way to find living cousins – just by searching the directory for your surnames. 99% of these cousins won’t be on GenealogyWise. 2) I have found and left a message on one Facebook group set up for an annual family reunion of not-too-distant cousins. These too can’t really be set up on GenealogyWise since it will be difficult to get family members who aren’t genealogists to join. But a Facebook group could be a great way to keep younger family members interested inbetween reunions. 3) Those genealogists who do research for others may find Facebook is helpful in letting those in your social network know what you are doing as a business. When they decide they want some research done – or someone they know is asking for references – they are more likely to think of you. Your social network isn’t going to follow you to GenealogyWise. On the other hand, there are a couple things I like about GenealogyWise. 1) I like their option of one rss feed for every blog post on the site. You can subscribe to rss feeds for individual members as well, if you don’t want every post, but the one super-feed is very useful. I find the effect similar to subscribing to tags on Wordpress. Every time someone tags a WordPress.com post with ‘genealogy’ it appears in my blog reader. And every time someone posts a public entry on their GenealogyWise blog, it will now appear in my blog reader. 2) Like the Facebook Notes application which allows you to display your outside blog posts on Facebook – or the TwitterFeed application that automatically posts links to your blog posts on Twitter -- GenealogyWise allows you to display your blog posts on your profile page. I know I have friends who read my blog posts on Facebook who otherwise wouldn’t, and I have been told by fellow geneabloggers they are often more likely to read a blog post when they see a link to it on my twitter feed. Similarly, I suspect some may now find my blog posts through my GenealogyWise profile. Of course, both of these advantages occur from me setting up the profile and respective rss feeds. I don't actually have to ever return to GenealogyWise beyond accepting any friend requests that come in. There may be some interesting forum and group discussions, but I find I prefer email mailing lists, such as those available on Rootsweb, for these types of discussions. If upon GoogleWave's release, GenealogyWise releases an application that turns these forum discussions into waves accessible through a Wave browser, I anticipate I may well become a participant in some of the forums. Update: it appears they are now displaying their site name as two words. This change doesn't predate the initial drafts of my post, but does predate the final posting, so unless they're psychic, or have access to my drafts, I can't take credit. Vicksburg, Mississippi, July 7th 1863. That I will not take up arms again against the United States, nor serve in any military, police, or constabulary forces in any Fort, Garrison or field work, held by the Confederate States of America, against the United States of America, nor as guard of any prisons, depots or stores nor discharge any duties usually performed by Officers or soldiers against the United States of America, until duly exchanged by the proper authorities. 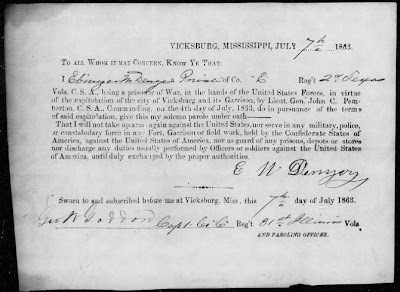 Sworn to and subscribed before me at Vicksburg, Miss this 7th day of July 1863. After being duly exchanged, though, all bets were off. His name next appears in Confederate records in February of 1864, and his service was uninterrupted after that through April of 1865. Google Alerts is a great concept, and can be useful for genealogy research. 1) You select whether you want Google to search News articles, blogs, the web, video, Google Groups, or a "comprehensive" search. 2) Then you select how often you want an email sent to your email address. 3) Then you indicate the email address in the field: "Deliver to." If you are signed in to a Google account, it will default to that gmail account. But a gmail account isn't required. It's tempting to think your work is done for you, and Google Alerts will now prevent you from missing anything important. But if you stop doing the manual searches, you may very easily miss important items. A 'Comprehensive' alert is an aggregate of the latest results from multiple sources (News, Web and Blogs) into a single email to provide maximum coverage on the topic of your choice. 1) How often when conducting your Google Search do you find the treasure on the second, third, or a later page? It probably depends upon how specific your search terms are. If, for example, you have provided the specific name of a particular ancestor, you might not miss much, unless the full name is common. If you entered a surname, you're likely going to be missing some results, especially if you maintain a family website, or blog, since hits on your own site might legitimately monopolize the top results. 2) Comprehensive is 'comprehensive' for News, Web, and Blog alerts. It won't capture the results from Google Video or Google Groups alerts. 3) Google Books results are now appearing in Google web searches. However, only for "full view" and "limited preview." Searching Google Books directly will yield results in the categories of "Snippet View" and "No Preview Available". The publishers of these books haven't given Google permission to show you a preview, but have allowed the books to be scanned in. You often have to track down these books in a library to see what the text says, but Google Books does provide the source information, including the page number where your search terms appeared. 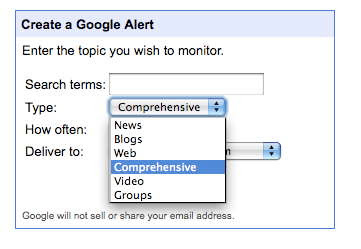 Google Alerts is useful if your search is very specific (of course, the more specific you get, the more likely that you might be missing something because you are too specific.) Google Alerts is also useful if you are only interested in the "top results" for a broader search. 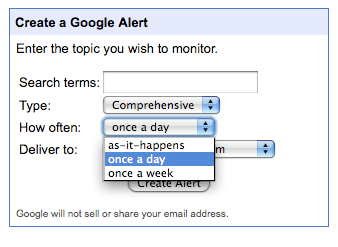 But you need to be aware that Google Alerts isn't a catch-all system. The word prompt for the 15th Edition of Smile For The Camera is "they WORKED hard for the family." 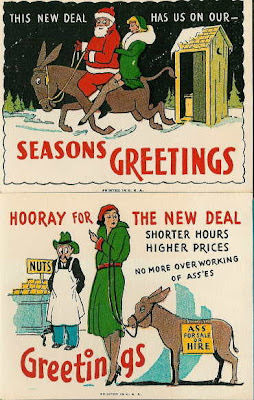 The professions of our ancestors are almost as interesting as the people themselves. Some of our ancestors worked very hard; they took in laundry, worked the land, raised many children, or went to school and became professionals. Photographs of them working are called occupational photographs and are rather hard to find. I agree, they definitely aren't easy to find. However, I have found a few. 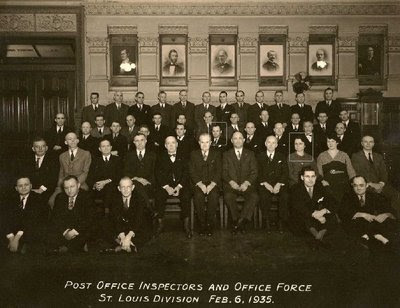 I'll start with my maternal grandparents Martin Deutsch (1907-1991) and Myrtle Van Every (1900-1951) who worked at the St. Louis Post Office together in 1935 when this photo was taken, less than a year before they were married. I've drawn a box around my grandparents. 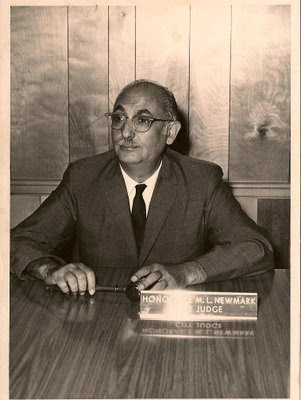 The below photograph of my paternal grandfather, Melvin Newmark (1914-1992), shows him with gavel in hand as a City Judge. I like how the nameplate reflects in the photo. Here's a photograph of my great grandmother, Margaret (Denyer) Van Every (1868-1923) at work on the farm. 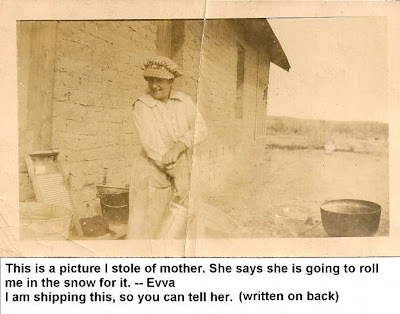 The photograph was likely taken after 1920, as the writing on the back suggests my grandmother, the recipient of the photograph, had already moved to St. Louis. The writing also indicates that El Paso had received some snow. Which isn't completely unheard of. Finally, I have a photograph - circa 1935 - of the Lichtmann Leatherworks shop in Margitta, Hungary - Address: 43 December Street - birthplace of my maternal great grandmother, Helen (Lichtmann) Deutsch (1881-1958). 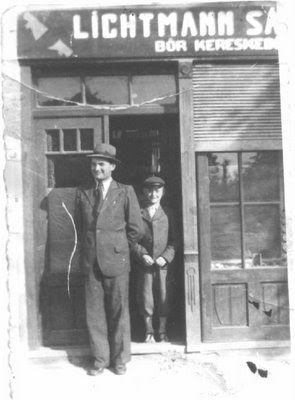 The people in the photo are my grandfather's first cousins, Andre and Sanyi Lichtmann, sons of Helen's brother, Frank (Fere). The 75th Carnival of Genealogy has been posted, and is filled with entries on Justice and Independence. Fireworks at a pier on the Fourth of July spell it with red wheels and yellow spokes. Steamboats turn a curve in the Mississippi crying in a baritone that crosses lowland cottonfields to a razorback hill. and joined the other side. Finally, he and his family fled to Canada. either in seventy five, or seventy seven. even when those beliefs changed. I've previously blogged that I only have Loyalist direct ancestors and no Revolutionaries. I've learned that's not exactly true. My fourth great grandfather, David Van Every, was a Revolutionary who became a Loyalist. Though I do note he was 18 years old in 1775, and 20 in 1777. I think about the decisions I was making at that age. My 4th great grandfather left one side of a war, and went to the other; I left one college and went to another. There's a long story behind my actions; I'm sure there's an equally long story behind his. While there's no certainty, one researcher suggests there may have been a familial reason David (and his brother, Benjamin) initially joined the New York militia. David and Benjamin Van Every perhaps had decided to join the New York Militia, as it was in this Regiment that the cousins of their father, McGregory Van Every had been serving: Martin as a Lieutenant, Cornelius (1730 - 1815) as an Ensign and later as a Lieutenant, and Rynier as a Captain. However, soon after deserting from the New York Militia, both David and Benjamin transferred themselves to Butler's Rangers, within which they fought for the duration of the American Revolution, David as a Sergeant and Benjamin as a regular soldier. --- "Warner Cemetery: an important piece of Canada's heritage worth preserving," Robert Collins McBride, The Loyalist Gazette, March 22, 2000. 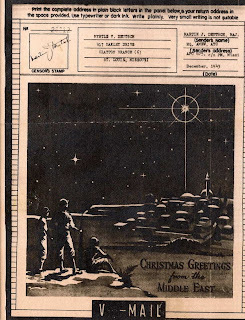 I just received in my email box the monthly issue of PastPorts, the newsletter for the St. Louis County Library's Special Collections department. The first sentence of the first article? computers at any St. Louis County Library branch. Unlike Ancestry.com, where I find myself searching their databases so often, free library access isn't sufficient -- at this point in my genealogy research, library access to Footnote will definitely be sufficient. My paid account will expire in September.